A tale of Kerry hospitality. We were seeking for a way up An Corran/ Finnararagh, never having climbed it or the summits to either side (Coomnacronia or Salagh). From the map there was a pair of tracks in roughly the right place going from the area of Fermoyle which would make for relatively easy access. 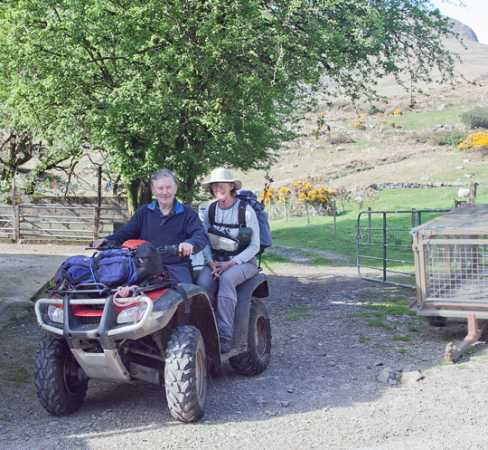 Arriving in Fermoyle we were met by the farmer and owner as it turned out of the westmost of the two tracks. We inquired about access. Not only did he give us access he found a place for us to park in his yard and then produced (free) sandwiches! The day was good and it was really great to proceed up the track without the risks that you take as an uninvited visitor. We explored the entire ridge from Coomnacronia, past An Corran/ Finnararagh and then to Sallagh, all part of that great ridge of the Dunkerron range. Coming back was laborious and steep however some 2k from the road the farmer appeared on his quad. To pick us up! And so began our first and, so far, only trip on a quad.